Greenerd will highlight its extensive hydraulic-press lineup and have experts on hand to discuss attendees' specific application needs and press requirements. 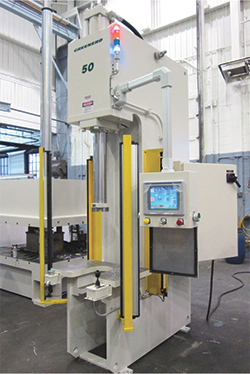 Greenerd hydraulic presses are available in a variety of styles including gap-frame, straightside, die-spotting and forging, with capacity from 3 to 40,000 tons and bed sizes exceeding 240 in. Customers abound in the automotive, aerospace, appliance and HVAC industries.